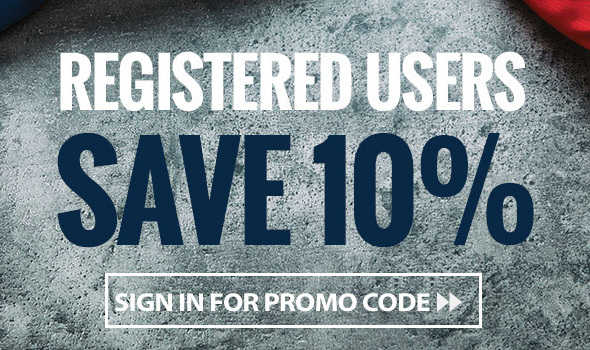 For a limited time, Rockler has a 10% discount on Laguna and Supermax tools and accessories! 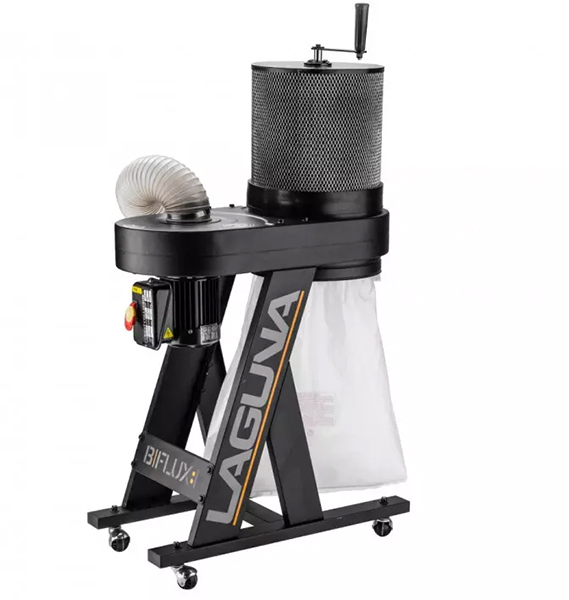 I’ve been slowly upgrading my woodworking tools, most recently taking advantage of an Acme Tools promo to get a Jet dust collector, and this promo was just the thing to push me into buying a 14″ bandsaw. I am more in need of a table saw and a jointer (less so, and I’m still indecisive about whether I should get a benchtop model or find the floor space for a bigger one), but discovering the deal had me taking a closer look at Laguna’s 14|12 and 14bx bandsaw offerings. I flip-flopped and ultimately decided on the Laguna 14|12. I actually placed an order for the 14bx first, but then back-tracked. They say that sale prices are valid from 8/31 thru 9/27 2018, but I can’t find any confirmation of that. Shop Now(Rockler Deal) – I coded the link with a free shipping code (for orders $35+), in case you want to shop for something else. The bandsaw has an added $75 freight fee, and the same looks to be true of other Laguna equipment. I’m really excited now. I’ve been trying to rip thin cuts on a portable table saw, but it’s been challenging. Forget about resawing. This obviously isn’t a deal that everyone can take advantage. How often does one buy woodworking shop tools? But I thought it was worth sharing. A recent Acme Tools Jet promo pushed me off the fence to buy a dust collector, and this deal pushed me to get a floor-standing 14″ band saw. Laguna is one of those brands that’s often price-fixed and excluded from all other promos, such as Acme Tools’ ongoing Labor Day sale. I’m still surprised by my decision to go with the 14|12. I’ve heard a lot of bad things about Laguna in recent years, but despite all that, the 14|12 seems to be a very popular bandsaw, and there are lots of comments about Laguna quickly responding to customer service inquiries and requests. I’ve been afraid to buy any new equipment in recent years, resulting from the very many negative feedback I’ve heard about. But the fact of the matter is that I’m not prepared to buy the “best of the best,” nor do I have the space for a lot of heavy equipment. Deals like this one helped me get over that hurdle. Now, I have 2 months to find the space for a table saw (I’m thinking SawStop), and maybe a jointer (Powermatic 6″?). 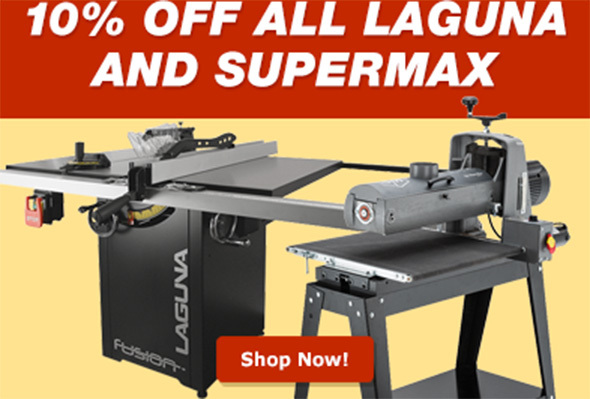 If you’re looking to buy any Laguna woodworking power tools and miss out on this sale, it’ll likely come back around Black Friday. As far as I can tell, this deal is only happening at Rockler. I haven’t purchased any big equipment from them yet, and so I’m hoping this will be a good experience. The bandsaw is being drop-shipped from Laguna, and lift gate service is available with no added fee (aside from the $75). FWIW – I’ve had great results using blades from Highland Hardware for resawing – both 1/2 and 3/4 inch. I went with a Laguna Resaw King, at least for my first one. I’ve got a 2.5 hp 14bx and use a woodslicer for resawing. That blade is a great price for what you get. I’ve been really happy with this set up. Not bad choices – but an 8 inch (or larger) jointer will give you the added bed length that you will need to do a good job on longer boards. While the Sawstop offers its patented safety features – some say its not a 100%professional cabinet saw. If you can afford it – I’d recommend comparing it to a Hammer K3. If I were replacing my 70’s vintage Unisaw – the Hammer would be at the top of my list. Aside from the price difference, the added complexity, and availability of accessories, I’m interested in the SawStop for its safety features. I also noticed the Hammer A3-31 combination planer/jointer. Realistically, it will be easier for me to justify something lower priced, which I can eventually donate or resell with greater ease. It’ll be hard to justify the space for a jointer, as it is. While I know a lot of people tend to regret 6″ and yearn for 8″, that’s a big step up in size and power. If I’m working with boards larger than 6″, they’ll ideally be surfaced for me, or special enough to warrant hand planing or flattening with a router sled. Are you planning to stick with knives or upgrade to a segmented cutter head for the jointer? I’m not sure about the segmented vs. knife cutter. Using the edge of a straight knife cutter as a knicker you can use a jointer to cut rabbets on most machines that have a ledger . Just a thought. I’m not sure, but I can see why you brought that up. With straight knives, you get a square edge to the rabbet. With carbide inserts, you might not get as clean a shoulder. I didn’t even consider using a jointer for such purposes, and even if so, the quieter cutting, better surface quality, and long time before rotating or replacing inserts would be more important to me. I wish I had the money for a combo jointer/thickness planer. I never work with really long stock but having 10 or 12 inches for a jointer would be great. Makes me jealous of my European friends who can find them used since they adopted them early over there. If Jet could make their little benchtop models more reliable they’d probably sell like hot cakes. That’s part of the problem – nobody makes good benchtop tools anymore because consumers don’t want to spend the money. If a benchtop drill press was priced at $250, would you buy it? Most people in the market for a benchtop drill press might wants it at $150 or less. If they budget more, they want a floor-standing model. So, because of lower demand, the number made is lower, and prices are bumped up higher to reflect higher production costs, and maybe opportunity costs as well. Lots of “idle talk” here and elsewhere about “buy American” – but then when it comes to actually laying down the cash – most folks want Harbor Freight prices – which likely means made in China with dubious quality control. Wal-Mart would not stock its shelves with cheap goods if they didn’t sell. This buy whatever’s cheapest and throw it away when it breaks is the enemy of quality manufacturing. The comment about not being able to joint longer boards with a 6”jointer is a bit exaggerated I feel. I have a PM 6” jointer, and while it does have a longer bed than most 6” jointers, I regularly joint 8, 10, 12’ and longer boards perfectly straightwith it. I finished a commissioned 8/4 black walnut table a bit ago that was 8’ long, I had 9 boards that made up the top and you couldn’t fit a piece of graphene between any of the boards when dry fitted without clamps. I’ve done longer projects with the same results. It really comes down to knowing how to use a jointer properly. Do I plan on upgrading to a larger jointer? Yes, but I run thousands of feet of lumber over my jointer on a regular basis and it makes me money. Personally, I feel an 8” jointer is a bit much for a novice DIYer making cutting boards. I totally disagree about not going with an 8″ jointer. If there is one thing I’ve learned in the last 5 years of building up my tools is that I wasted a ton of money buying tools that I outgrew. I learned fairly early (thankfully) that you should always buy as big and nice a tool as you can afford or you run a very high risk of spending a lot more in the end when you realize you need to upgrade. Yes, you can get away with a 6″ jointer and, like you said, you can get good results on the longer boards, however, it is a pain the you know what and I think it’s borderline dangerous to try and run boards of that length and weight on a smaller table like that. If he can afford it and has the space then I recommend going with an 8″ jointer and never buying one again for the rest of his life. If space is an issue he can do what I did and go with the Hammer series…when I upgraded from my small benchtop jointer I went with the Hammer A3-41. Love that thing and I know for sure I won’t be buying a jointer or planer ever again. I disagree about the Sawstop. It will be more than enough for any hobbyist and, at least the 3hp and for sure the 5hp, would be enough for most small shops. I do agree with going to 8″ on the jointer if you can swing it. It makes everything so much easier and you might end up buying the 8″ later anyway. I went from a little 6″ jointer all the way to a Hammer A3-41 and I LOVE THAT THING. Forgive a novice question, but when it comes to stationary woodworking power tools, which brands are “best of the best”? Conversely, which are the higher quality mid-tier brands? From what I can tell, brands like Jet, Rikon, and Grizzly are at a base tier of tools that might require extra attention and finagling, Powermatic is at the mid-tier – a step above, but with some complaints about quality – and brands like Felder that are aimed at high volume production shops. But within the tiers, there are big swings in price and capabilities. With jointers, for example, there are straight knives, helical knives, dovetailed ways, parallelogram tables, and sometimes other aspects that can swing pricing several hundred dollars or more between models. Dude…get the A3-31 (or 41). You will not regret it. It will save you space and give you flawless results. You will never have to buy another jointer or planer again. most people asked what I was going to ask. I’ve always thought of powermatic had become sort of the go to proline – prosumer shop equipment. And beyond that you moved to things like the hammer. All well beyond me at the moment – or probably ever. On the joiner – you mentioned benchtop models. If going that route what are you looking for? I’ve always thought about one to compliment my table saw, mitre saw setup and help with closer fits. Do you already have a router table setup? I thought the same about Powermatic, but I have also heard a lot of knocks about their current quality levels. I keep flip-flopping. Cutech had a sale on Labor Day, but I think I’d rather have a (small) floor-standing 6″ jointer than an 8″ benchtop jointer. I have a router table – I bought a Woodpeckers setup and am using a Bosch-made Craftsman motor on it, and a Rockler switch. I hope to build a workbench around it at some point. The problem is that I don’t like buying big tools twice (meaning I’d rather buy the tool I want than a tool I know I will have to step up from), and I don’t like hassles. I want equipment to work, after some initial assembly, with minimal effort. I have limited time, and I want that time spent on project work, and not on tinkering with machines outside of regular maintenance. These days, nothing seems to be built like they used to. There are some folks who would argue that you should buy a 50 year old Oliver or other professional brands like Newman or CO Porter jointer. The 1950’s and 1960’s may well have been the golden age of USA-made woodworking machinery from a long-lasting quality standpoint – but some modern features (like Shellix heads) may be lacking. Buying used does require much more homework and patience in finding what you want in good condition for a reasonable price. BTW – some of the best of today’s jointers seem to come from European factories like the one in Italy that makes the SCM machines. I don’t have the space to allocate to a floor standing jointer but I could sell myself on a quality make bench top piece if it had a long enough feed tables. I think that would be important on a jointer. I also agree as I’ve looked at the ability – I’d see no reason to have larger than a 6 inch. Again space concerns. For occasional use ,the 1412 is fine, you should have no problems, but for deep constant rips you’d want the BX. Thanks! I read that as well, about the high amperage draw with taller resawing. I first ordered the 14bx, because I like the idea of one-piece construction, and the brake could be handy, but cancelled within an hour and ordered the 1412. The 1412 can be wired for 220 (I won’t), and the 14bx looks to have the same motor (110V version), and upgraded magnetic switch. I figured that the 14bx is a better option if I wanted to go with the higher HP 220V motor. If I do a lot of resawing above 6-8″, which I don’t anticipate at the moment, I could upgrade to the 14bx 220V or something larger at a later time, and then keep this one for cutting curves. Or, with the 2-piece base, I could lower it slightly to better fit in the basement. Why the aversion to the higher voltage single phase circuits? Ultimately you will likely want to wire your shop to power a table saw and jointer that would benefit from the lower current draw. I can see not wanting to mess with a phase converter to provide 3-phase shop power – but if you have room in your breaker panel or sub-panel – adding some 220V shouldn’t be too hard or expensive. If I’m buying 220V equipment, I have to know EXACTLY where it’s going to go. I cannot do that just yet. 110V? I can move it around. So a 110V tool I can buy and put to immediate use, assured that even if my floor plan changes – which it will – I can move the tool and still be able to use it. 220V tools are often bigger and more expensive. They’re bigger commitments. My new Jet dust collector? If I outgrow it, I can move it to the basement and use it for an eventual CNC. A 220V cyclone? If it’s too big, there’s nowhere it can go. If I want to move it within my workspace, my options are limited. I have a single 220V circuit now, but several independent 110V circuits. I know that’s an option, but one I’d like to avoid if possible. You aren’t the only one. I ran into similar issue with commercial equipment as well. I understand that sometimes there is just no way around it however I almost always prefer to see a 110v option when purchasing commercial equipment. This is especially true when I know that I will have to move or rearrange the shop shortly after. The 10% off is still going on all these months later…or maybe it’s back? Anyway, it isn’t limited to Rockler. I’m thinking about getting Laguna’s edge sander, the 20″ disc sander, the OSS sander and, why not, a 1412 so I don’t have to constantly change blades. I need to choose just one or two machines though. I’m not going to drop $10k right now! I bought a Laguna LT16HD a little over a year ago. I recently resawed through a ton of board feet of walnut and maple and it also makes great veneer. I cannot say enough about that bandsaw. My only complaint might be that the dust control could be better but it really doesn’t bother me that much. I also have their CFlux 3 Cyclone DC and I have been very happy with that as well. I’ve followed the saga of their alleged poor customer service through the years. I honestly feel like you have just a few guys who are a bit like woodworking divas and they alone blew up that story line into something that is ridiculous. When Laguna didn’t bend over backwards to kiss their asses and offer free everything they went off. Some guys are like that. It only takes a few pissed off customers who are willing to spend the time and energy bad mouthing a company on a couple of different forums over and over to ruin a company’s rep. I think that is what happened. I’m not sure how else you explain the ton of great customer service reviews that Laguna routinely receives. It makes no sense. I’m not saying there weren’t some instances of bad CS, just that it seems as though it was blown way out of proportion. FWIW, I’ve only had one issue and they were wonderful to work with. It came back for a limited time.